DCL certification ... milestone for Hira Industries. 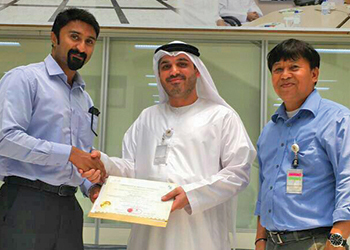 Hira Industries, a leading UAE-based manufacturer of Aerofoam insulation, has been awarded Dubai Central Laboratory (DCL) quality certification by the Dubai Municipality for maintaining green building regulations and specifications standards across its products and operations. Hira Industries was awarded the certification for Aerofoam XLPE and NBR following a comprehensive assessment of its internal quality control system. XLPE and NBR is Standard Specification: GBRS Clause 502.11 compliant and meets the most stringent standards for fire performance and energy-efficient products. The recognition comes as a significant fillip for Hira Industries and is a testament of its commitment to quality, health, safety and environment towards its customers. “We are deeply honoured and humbled with the DCL certification. It is an important milestone for Hira Industries. As an organisation, we have always taken care to ensure that all our internal processes and products comply with the highest quality standards. The certification is a testament of our commitment to develop quality solutions that are in line with Dubai’s Green Building Regulations and Specifications,” said Umesh Unni, regional commercial manager. The DCL product conformity was developed to enable manufacturers to prove that their products meet the requirements specified by Dubai Municipality according to Green Building Regulations and Specifications. The standard describes the quality assurance, factory assessment and independent testing that must be addressed in order to ensure the conformity of products. “Ever since Hira Industries was launched, we’ve been committed to developing technologically sophisticated products that meet the most modern requirements. DCL certification is a strategic move that showcases our keenness to provide best services to customers. It reflects our commitment to achieve the UAE government’s vision to create a smart city that provides sustainable living, implementing the best international practices,” said Unni. The DCL certification further builds on the company’s string of accolades, and is an indication of its constant pursuit of excellence through embracing international quality standards, a step that puts Hira Industries ahead of the curve. Hira Industries started its journey as a distribution centre for air-conditioning products in 1980 and was initially called R Hira Traders. Three decades on, the company has focused its growth on manufacturing products for the building and construction sector across projects around the world. It manages eight factories in three different countries, occupying two million sq ft and employing over 1,000 employees.